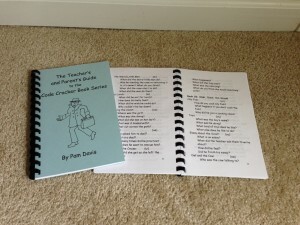 Out of all of Pam’s curriculum and products, The Teacher’s and Parent’s Edition is the most helpful for an educator. While it is not necessary to properly use the curriculum, it is a wonderful source of inspiration into the many uses and advantages of Pam’s work. Within it, you will find comprehension questions for each of the 80 books in her series, the Code Cracker Book Series. You will also find an in depth overview of each of the tools and resources Pam uses in her curriculum, and how to best use them. That includes the Comprehension work sheet, Stretch Write and Spell, Fluency, and Sound and Word Recognition. Don’t miss out on this phenomenal resource!